1998 Heritage 575, One-Owner, 100% Original with OHSC, Mint! 1998 Heritage jazz box: 575 Model. This would be similar to a Gibson ES-175. I can tell you this one has a killer bottom end – you can play walking bass lines with this guitar! Plays and sounds really great – beautiful guitar! This is a one-owner guitar, 100% original with OHSC, Mint condition! 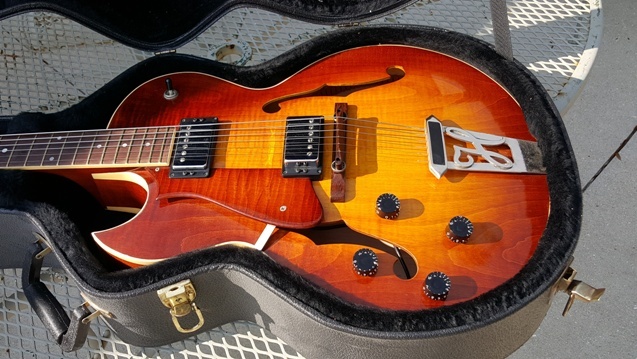 Similar to a Gibson ES-175 (impossible to find in lefty) at 1/2 the price!